We’re probably smack in the middle of the hottest time of year right now. In my kitchen, that equals easy, one-pan dinners that avoid the oven and don’t require keeping the stove on for too long. 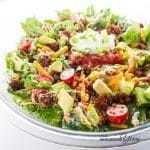 Salads are perfect for checking those boxes, but of course you still need some protein in there to make it a full meal. That’s where this easy and healthy taco salad recipe comes in. You’ve probably seen Mexican taco salad at restaurants before. In case you haven’t, it’s basically like an enormous Mexican taco in bowl form. No taco shell needed! 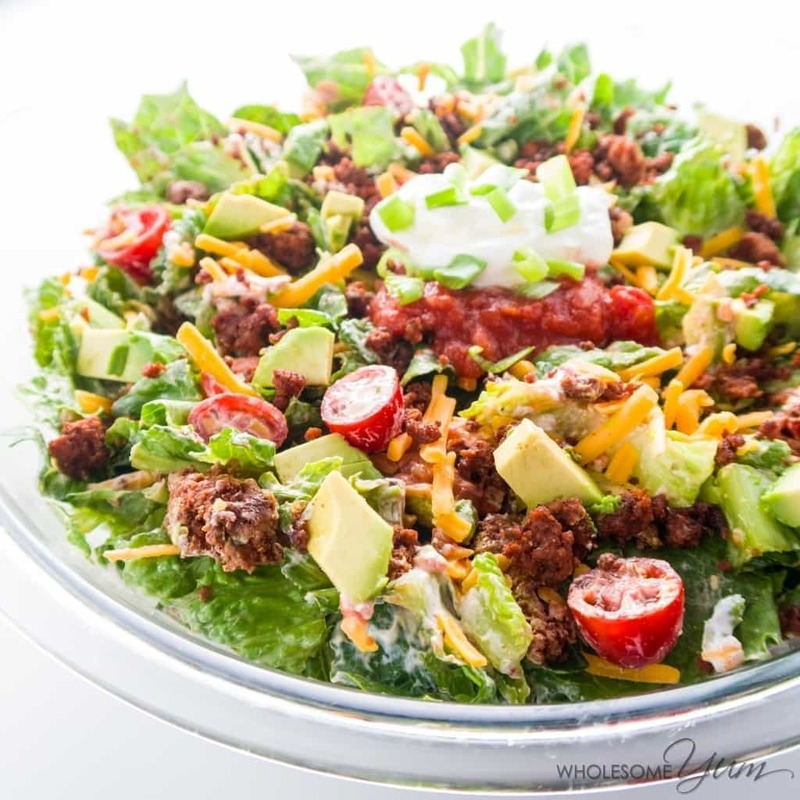 Unlike most restaurant versions, my healthy taco salad is low carb and gluten-free. The way to make easy taco salad is to use simple ingredients. After browning the meat, all you have to do is mix everything together! Store bought taco seasoning saves a lot of time and makes the process easier, but check labels to avoid sugar. It’s not hard to make your own if you have time, though. Salsa and sour cream stand in lieu of a dressing here, which works out surprisingly well. Why spend time creating a complicated taco salad dressing, when these work just as well? When you mix it all up, it tastes like there’s dressing in there, anyway. Possibly the best part is that the whole thing incorporates just ten ingredients from start to finish. And, it’s on the table in merely twenty minutes. The only cooking involved is browning the ground beef on the stove for ten minutes or less. So simple. If you like super easy recipes, you’ll probably like this mason jar Greek salad too. This easy taco salad recipe also makes a generous amount – six large servings to feed even a larger family. But if you don’t need that many, don’t worry. It’s also super easy to adjust it to fewer servings if you need to. The key to making taco salad healthy is using natural ingredients. You really don’t need any store bought dressings or chips in there. But, for those that do want a little crunch, you can try adding low carb tortilla chips. If you have Mexican night (or Taco Tuesday!) 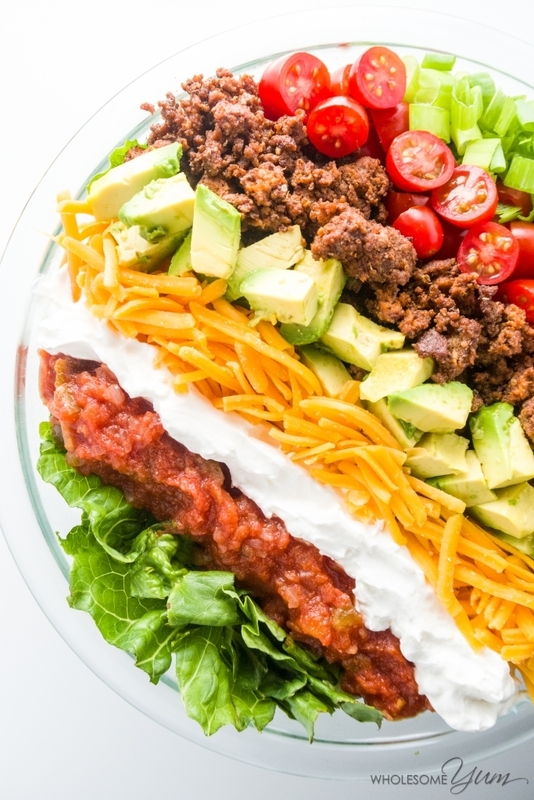 at your house, this low carb taco salad will fit right in. When we do it, we often have the typical wraps and tacos (made low carb with my paleo low carb tortillas) or spicy chicken cheddar nachos. An easy taco salad is even simpler than those, and it’s still packed with all your favorite Mexican flavors. The smoky seasoned browned beef, juicy grape tomatoes, creamy avocado and sour cream, crispy Romaine lettuce, sharp cheddar cheese, and spicy (or mild!) salsa are all combined to perfection. It’s pretty incredible what complex flavor you get, with multiple tastes in every bite, using so few ingredients. The pre-made taco seasoning and salsa definitely help in that department. Any salsa variety you like will work great here. Choosing different kinds is an easy way to get creative without adding complexity. Use mild salsa if you want it mellow, spicy if you want a kick, or go outside the box with more unique flavors like green chile or peach. You can totally make your own, too, but salsa is one of those foods that actually has plenty of store bought options without weird ingredients. Just read those labels. 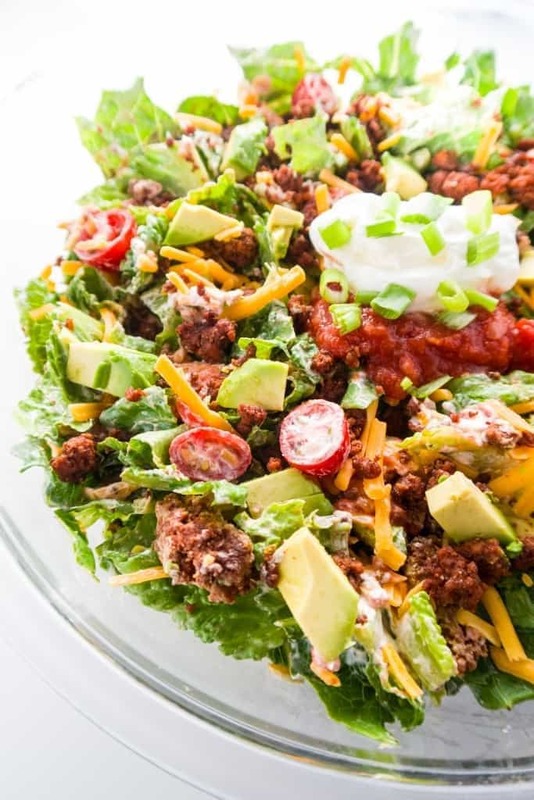 You can easily customize this healthy taco salad recipe to your liking. Feel free to throw in any other veggies you have on hand, or omit anything you don’t like. That’s one of the great things about easy salad recipes – you don’t have to be that precise! If you’re wondering what to serve with taco salad, one of my favorite things are 4-ingredient almond flour biscuits on the side. But, I actually think it’s delicious on its own. That’s one of the things I love about it. It’s an easy dinner all in one bowl! To make it paleo, you can omit the cheddar cheese and replace the sour cream with coconut cream and a little sea salt. Either way, you can’t go wrong with a 20-minute all-in-one dinner. Make it tonight and dig in! Nutrition information is estimated based on 85/15 ground beef and typical tomato salsa. Click or tap on the image below to play the video. It's the easiest way to learn how to make Taco Salad! Hi Patricia, It’s 6 servings for the nutrition info as listed. Or you could divide it into 4 servings instead to make larger meals. That’s a wonderful idea to just throw together a taco salad. I looove tacos! I love this option during the summer. Such a great twist to keeping it healthy while getting my taco fix. This was easy and delicious, my favorite things. I will be making this tonight. Just one suggestion for those of you wishing a bit of crunch with tortillas. 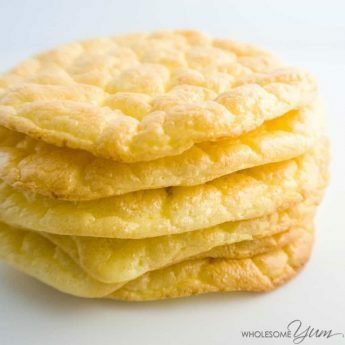 Why not make some cheddar crisps on the stove, in the oven or microwave. Personally I nuke small rounds of cheddar in the microwave for about 1 1/2 minutes on some parchment paper. These are a nice snack all by themselves too. Nice added crunch. This is so fresh and tasty! So simple, but so good. Perfect for a summer supper. 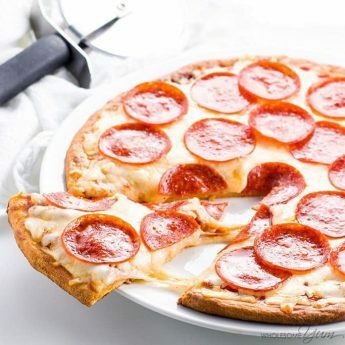 I just started on the Keto Diet and this was so yummy!! 🙂 I never thought I would be eating tomatoes and avocados, but here I am. Thank you for sharing your recipe! You don’t list how much sodium per serving. Is that because it’s VERY high? Hi Pat, I only have the macronutrient information available for my recipes, and provide it as a courtesy. This is across the entire site, not because it’s very high. 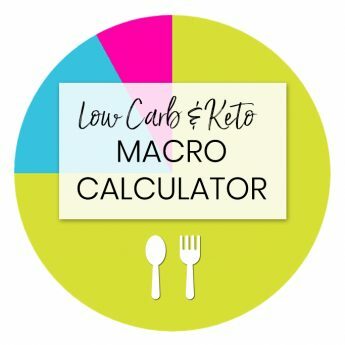 You are welcome to enter the ingredients you use into an online calculator if you need other information. I LOVE this recipe. I make it all of the time. I use Classic Taco Skillet Sauce Starter from La Tortilla Factory, Gluten-Free. (Found at Walmart Neighborhood Market) For 1/2 tbsp, the sauce is 35 cal, 1 g of carbs, 3.5 g fat, and 0.5 g of protein, 0 fiber. I also add a dill pickle for a little extra punch. DELICIOUS! And, my other go-to for this salad instead of the salsa is Marie’s Creamy Avocado Poblano salad dressing. 2 Tbsp = 80 cal, 8 g of fat, 1 g of carb, 0g protein. One of my go-to recipes. I use my own taco seasoning – which is super simple to make in bulk and keep on hand. You had me at taco! This is totally my kind of salad! The taste was great, but the texture was gummy. What is missing here is the water mixed with the taco seasoning mix (pkg. instructions), which would make a nice creamy sauce without adding any carbs or calories. Where do you buy low carb tortillas and what is the brand, never seen any at any of our stores? Hi Tina, You can make them like this. Made this today for the 1st time and it’s a keeper!!! I am so happy to hear that, Rhonda! Have a great day! I really need to try this! It looks wonderful! 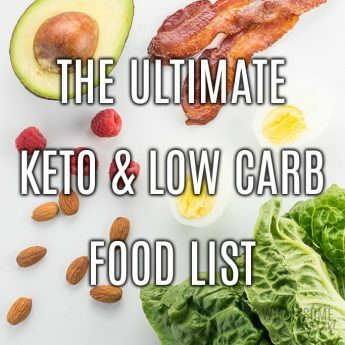 Hello I am going to try the Keto diet. I am afraid because I don’t eat avocados or tomatoes. Can I substitute with something? Or add more salsa or butter? This recipe looks great and I will make this weekend. 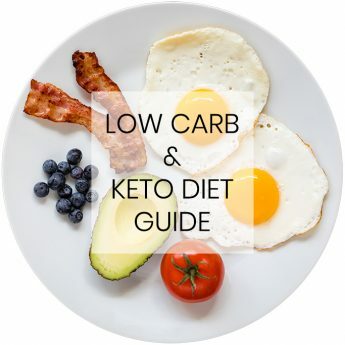 Thank you for explaining everything about the Keto diet. It helped me alot! The macro part still has me nervous I don’t want to gain! You can easily leave the avocado and tomato out of this recipes, Tamika! Thanks for stopping by! Yum, Yum! I added a little cilantro to our Pace Salsa and a little to the meat when cooking. I down loaded the recipe for the Taco seasoning, but when I looked at my Chili powder it had all the ingredients except salt and onion powder so it was 0 carbs. I highly recommend this salad. I am so happy you liked the taco salad, Donna! Do you have Sodium and Sat Fat nutritionals on this recipe. I would like to try it for my school lunch program. Hi Susan, The only info I have off hand is on the recipe card. If you need other information, the best way to find out is to enter the ingredients into an online calculator. This was a great, and very easy, recipe! Thanks! We added chopped cilantro and a squeeze of lime to the salad to give it the street-taco flavor and it was perfect! I love that you added cilantro and lime, Brandon! Have a great day! So should it be 1 tbsp or 2 tbsp for this recipe? Thanks! Hi Randy, You’re absolutely right! I had originally tested this with 1 tablespoon but have been making it with two for a long time since. I updated the recipe card to say 2 tbsp. Ultimately you can choose to your liking though! I love this salads! Such a great childhood memory for me. This looks delish! Thank you so much, Jack! Thanks for stopping by! Thank you, Ella! Thanks for stopping by! Just double checking – 8 oz. of chopped romaine for 6 servings? Hi Anita, Yes. 8 oz of romaine is approximately 3 cups, so it’s 1/2 cup romaine per serving but there are lots of other ingredients in a serving so the romaine is just a small part of it. You can definitely add more romaine if you want to, though! Hi Marie! I am so happy you liked the salad! It turned out great. I just use ground turkey instead. 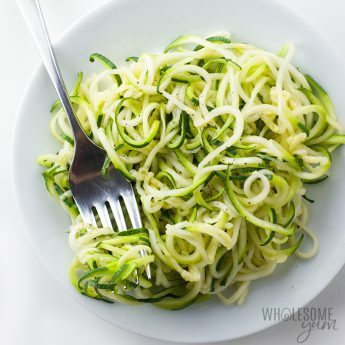 Love everything about this recipe!! Very yum. Love that it’s easy to make. Can’t wait to try this. I will leave out avocado so what would that do to the nutritional breakdown? Hi Heather, if you leave out the avocado there will be less fat, carbs, and protein. You can find out exactly what the nutrition facts would be by putting only the ingredients you use into a nutrition fact calculator. Hope this helps! Very good! The whole family enjoyed it. You made this look so easy to do! I love the way it looks when it’s ready too. Thank you for sharing how to put this together. 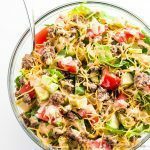 This taco salad recipe has become a regular in our house! We love it because it’s filling AND healthy. Thanks so much! Love the black bean idea. The only thing with ground turkey is that it has very very high instances of salmonella. Ground bison is very lean though! Using ground turkey would be healthier! I also add black beans, not from a can. 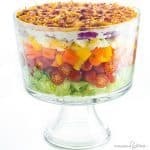 I make a big pot and then freeze them in containers so they are ready when I want to put one of these salads together. I could eat three servings in not put a dent in my carb intake. Thanks. Mmmm. 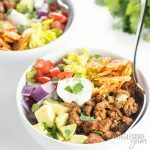 We love taco salads at my house and this one looks like a winner! You’re right! Perfect for those hot kitchen days. Lol. 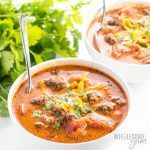 A low carb way to Taco Tuesday! This is cause for fiesta!!! Love everything about this recipe!